Washing clothes by hand involves lugging many buckets of water from stream, well, or barrel positioned to catch rain water, heating the water, adding soap to one tub and fresh rinse water to another tub. The long, arduous, time-consuming outdoor job of scrubbing soapy clothes over a washboard was gradually replaced by innovative hand-operated machinery that saved homemakers hours of backbreaking labor. And to think the washboard was a new invention in 1797! Catharine Beecher, an early advocate of bringing order and dignity to housework, called laundry “the American housekeeper’s hardest problem”. Women from all classes tried to find ways to get relief from doing laundry. Some hired washerwomen and others used commercial laundries. Eventually mechanical aids lightened the load. Once clothing was washed, excess water was typically removed by wringing, but the fabric still retained a great deal of rinse water. Not long after rotary machines were first invented, a roller was affixed atop the barrel for use in “mangling”, or pressing excess water out by manually cranking between the spring-tension wooden rolling pins. Each laundry item would be fed through the wringer separately. The wringer would be swung over the wash tub so that extracted wash water would fall back into the tub to be reused for the next load. See another image of a 19th Century Metropolitan Washing Machine HERE. American James King patented the first hand-powered washing machine to use a drum in 1851, the drum made King’s machine resemble a modern machine. The rotary washing machine was patented by Hamilton Smith in 1858. 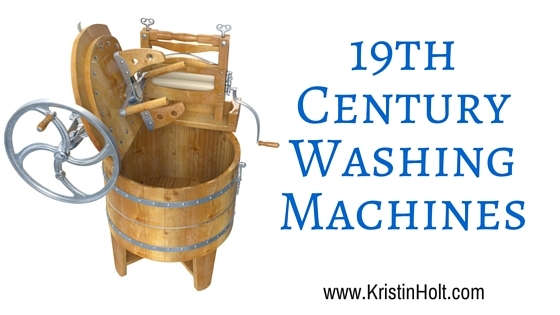 The newly invented washing machines didn’t become generally available until the 1880s. Many women forewent the machine until the 20th century because it had a tendency to tear clothes or leave rust marks. And the washing machine was only the beginning: the clothes had to be soaked, rinsed several times, boiled, starched, blued or bleached, wrung, then hung up to dry and ironed. Washing machines must’ve been a scarcity and luxury in the Old West, as they’re bulky, heavy, and take up precious transportation room in a covered wagon or freight wagon. By the time the Transcontinental Railroad joined the East and West coasts of the United States in 1869, they must’ve been more available to consumers. Hand crank washing machines were first offered by the Sears, Roebuck and Co. catalog at the late date of 1896. Is it any wonder well-to-d0 households hired housekeepers, sent clothing to a laundry, and essentially passed off this difficult task to others?